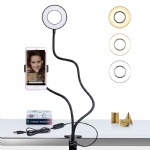 【Powerful and Stable Magnetic Force】 The Bovon Universal Magnetic Holder produces an stronger magnetic force of attraction that will hold any devices. 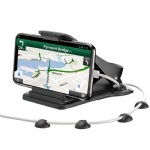 This car vent holder guarantees your cellphone is securely mounted in the holder regardless of road vibrations or impacts. It is really a perfect driving buddy for you. 【Simple Installation】The plate can be directly placed on the case or phone using the adhesive backing. Note: The phone does not support wireless charging if you stick the metal plate to the middle of the phone. If you stick it directly to your phone or case, you must ensure that the surface is smooth. 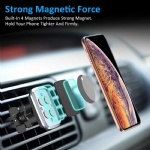 【Universal Compatibility】 Bovon Magnetic Air Vent Car Phone Mount fits for all smartphones: iPhone X / XS / XS Max / XR / 8 / 8 Plus / 7 / 7 Plus / 6s / 6s Plus / 6 / 6 Plus, Samsung Galaxy, HTC,LG, Nexus, Nokia, and etc. You can adjust the tightness of the clip by turning the clip knob. 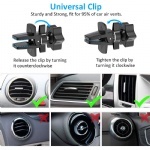 sturdy fit for both thin and thick car vent blades, compatible with 95% of car air vents. 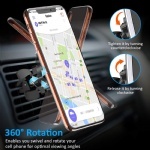 【360° Rotation Car Vent Mount】 With the highly flexible 360 degrees rotatable ball joint design, you can swivel and rotate your cell phone for optimal viewing angles, ensures safe and effortless driving whether you are talking, navigating, listening to music or charging your phone. 【What You Will Get】 1 Magnetic Car Air Vent Phone Holder, 1 Round Metal Plate, 1 Square Metal Plate. 12 month Bovon Warranty with Amazon 30 days Full Refund Guarantee; Lifetime customer support for Bovon car Air Vent Phone Mount. With adjustable knob air vent clips and powerful and stable magnetic force design, it can be mounted sturdy on your car and holds your device firmly, which is convenient for you to operate your smartphone while driving. The phone does not support wireless charging if you stick the metal plate to the middle of the phone. If you stick it directly to your phone or case, you must ensure that the surface is smooth. Otherwise it can't be pasted. 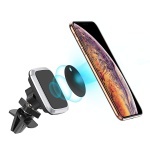 Fits all smartphones: iPhone X / XS / XS Max / XR / 8 / 8 Plus / 7 / 7 Plus / 6s / 6s Plus / 6 / 6 Plus, Samsung Galaxy S9 / S8 Plus / S9 / S8 Note 8 / Note 9, HTC,LG, Nexus, Nokia, and etc. The fully adjustable ball joint allows 360-degree swiveling and rotation for optimal viewing angles of your device. 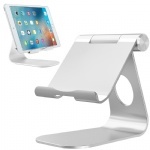 Pocket sized cell phone holder can be used as travel stand and hands-free phone cradle on desk or table top. 12 month Bovon worry-free warranty with Amazon 30 days Full Refund Guarantee; Lifetime customer support for Bovon car Air Vent Phone Mount.